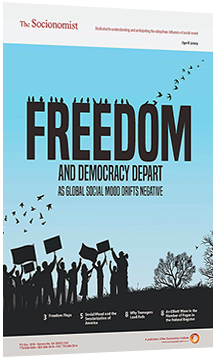 In a November / December 2007 two-part report, socionomist Alan Hall anticipated the impending shift from positive to negative social mood in Russia. Nine months later, the Russian Trading System Index plunged. In the years since, news from Russia has described increasing loss of press freedoms, stifled political protests, military aggression against Ukraine, increasing belligerence toward the West, economic sanctions, trade restrictions and authoritarianism. In this November 2014 update to his original study, Hall reviews authoritarian actions by Vladimir Putin that reveal his darker side, such as his human rights offenses, cyberespionage efforts, international airspace violations and nuclear weapon developments. Continue reading this nine-page report to learn about Russia’s recent developments in offensive nuclear weapons and the public’s escalating fear of a possible a nuclear war between the US and Russia.